As part of a class where students gained extensive experience in the field, my colleague Sarah Yarnell led a team of researchers at the Center for Watershed Sciences that developed a virtual field trip as a pre-field trip teaching tool, and a way to expose the public to locations that they may not be able to visit. In coordination with faculty at the University of Worcester in the UK, we collected spherical panoramas, audio, GPS locations, video, gigapixel imagery and still images of about 100 locations in and around Tuolumne Meadows in Yosemite National Park and brought them all together into a seamless experience for students and the public. The teaching tool provides its own navigation through the locations to emphasize key concepts, and the public can navigate via map or buttons in the panorama that take them to new locations. In this team, I helped determine equipment to be used, media formats, and tooling for bringing components together, and I led the development of the companion code for lectures. 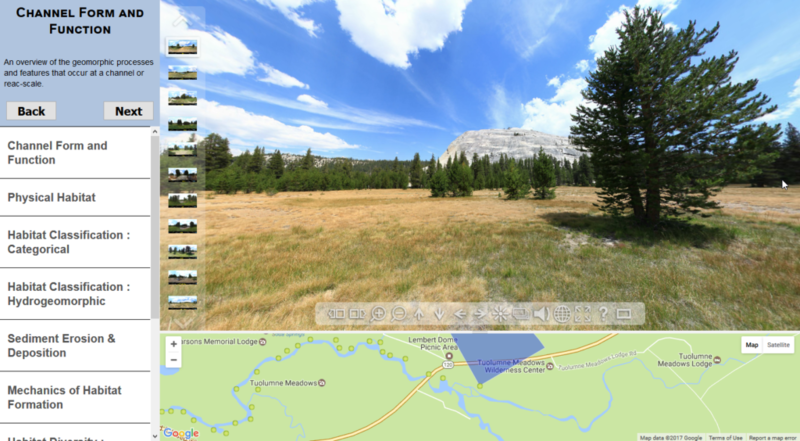 I was also a member of the team that collected the media for this project within Yosemite.